Making sure your website looks great and function flawlessly on whatever screen it is accessed from, whether that’s a tablet, smartphone or a desktop is now absolutely essential. Why having a mobile web design has become a necessity? Your business success depends upon how effectively you communicate with your target audience. Over 75% users are browsing your website over a mobile device. You could lose potential customers by not having a mobile web design. 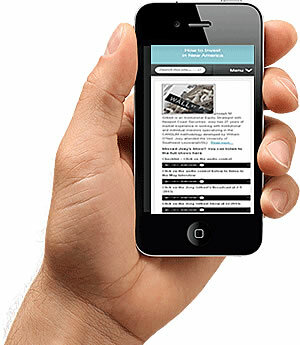 Mobile web design is build using media queries. Mobile websites are created using percentages not pixels. Because of increasing reliance on mobile phones and tablets to browse the Internet, it is vitally important to have an adaptable website. NetQwik designs websites with this in mind. 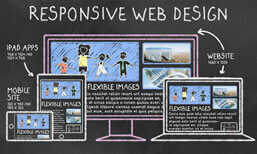 NetQwik designs responsive websites. Responsive web design (RWD) is a web design approach aimed at designing sites to provide an optimal viewing experience—easy reading and navigation with a minimum of resizing, panning, and scrolling—across a wide range of devices from desktop computer monitors to mobile devices. A site designed with RWD adapts the layout to the viewing environment by using fluid, proportion-based grids, flexible images, and CSS3 media queries. The web is going mobile: More smartphone owners access the internet from their mobile devices. Increase your Search Engine Presence: Google announced that they will be dropping websites that are not mobile friendly from the mobile search index. Management: Keeping one website up to date is better than having separate mobile and desktop sites. Cost: Building one single responsive site is cheaper than building a separate websites for each device. NetQwik is the perfect choice for your business. We have tons of options for you. Our web design cost is affordable and we have a pay as you go policy. Plus we have the best customer support around.